UK-based technology company Dyson spent over two years coming up with its latest lighting product, the Dyson Lightcycle Task. And this new development started from thinking about how a light contributes to users’ wellness. 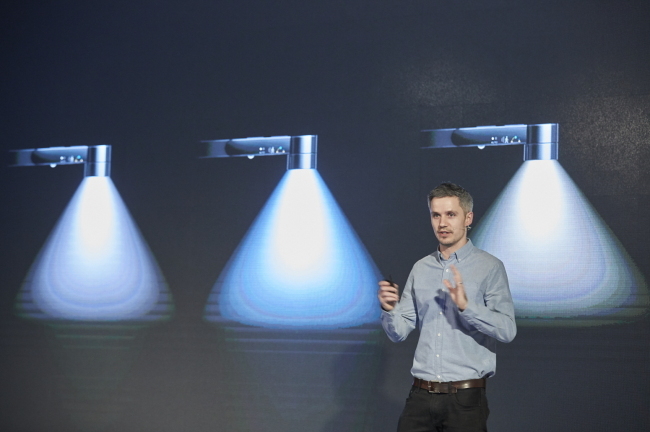 In an interview with The Korea Herald held after the company’s unveiling of its first lighting product in South Korea, Simon Cross, who led the design and development of Task Light together with Jake Dyson, explained the time and effort over 90 engineers at Dyson spent on making a total of 892 prototypes of the new light. Jake Dyson previously ran a separate lighting company. He joined Dyson as a non-executive director in 2013 and incorporated his lighting business into Dyson in 2015. One of the major challenges Cross faced was to eliminate multiple shadows by using multiple light-emitting diodes to get different color ranges, which has never been addressed by other light companies. To solve the shadow problem, the Dyson engineers situated the LEDs close to each other. But mixing the chambers generated a lot of heat, hence the heat pipe development was crucial, he said. Dyson devised a vacuumed heat pipe made of copper inside the head of Task Light, which helps release heat generated from the LEDs. A drop of water inside the pipe cools down the heat, helping maintain the color temperature and brightness at desirable levels. The company has also equipped the light with its unique algorithm that keeps track of natural light in the surroundings of the Dyson product based on time, date and location data, in order to allow the light itself to automatically adjust the indoor brightness throughout the day, which helps boost one’s biorhythms. Users can also set up to 20 different modes, including sleep, wake-up, relax, precision, boost and away, via the Dyson Link App on their smartphones for automatic control of the light. “But Dyson is more focused on problem solving than squeezing in fancy AI and IoT features into products,” a Dyson Korea official added.